Worst hotel we have ever stayed in! This is the worst apartment we have ever stayed in, we have been to many Greek holidays, and this is the worst. When we arrived the toilet and shower were filthy and the room cleaning poor. The cooking equipment were all rusty, and dirty, the towels and bed linen were all marked.The tables inside and out were basic plywood tops which were also all marked. The wardrobe was only suitable for one person, as well as the door hanging off its hinges . The owner was lazy and his sons, and didn’t care less if you reported anything to them. The only plus is the swimming pool area, which was very clean, its a pity they don't spend the same amount of attention to the rooms. Also the hotel is in a very good location. One of the worst hotels I have ever stayed in. Minimal self catering equipment, home made furniture, dirty, appalling bathroom, no views or sun as bedrooms face a mountainside (about 3m away!!). The most uncomfortable beds ever, bedding and towels never changed, minimal cleaning. The pool isn't on the roof it's built into the hill side as if you imagine large steps going up the hill, and yes it is a sun bathers dream and we thought it was fantastic. Location is good also due to little passing traffic etc. outside. Nico is a good chef! His pizzas and Greek salads hit the spot. Costas, the owner, was very helpful. However, breakfast was a let down especially if you have one too many Oozo's the night before and have to be up early. The pool was a cracking sun trap as it was on the roof of the complex. The room was ok but the bathroom let it down due to basic shower. Colin our rep was a god send! The best rep we've had! Took the time to get to know each of us over a few drinks and a packet of paracetamol. This was the second time I had been to this complex. First time a year ago was in June 2003. I had one of the twin rooms on the newer part of the hotel this was fine, compact but ok.
Next time in September04 we were in the flat. This was spacious but awful. Showers and toilet parts just not up to a decent standard. General cleanliness very poor. Decor non existent. The only thing going for this self catering flat was size. We did not feel comfortable in this flat. It's just not to a decent modern standard. I was told by guide that the contract between Olympic would not be re-newed unless these were up graded. Would be interested to know if this has happened. So they should have been sorted for this year. Also noted that the swimming area pool the location of which is outstanding was much better previous year in June. Perhaps they are not keeping up the standards through the season. In sept general unclean slimy and green at the edges. This was not the case in previous year. Also in previous year the was a courtesy bus to a beach. This was a great asset. But in last visit this was no longer a part of the hotel service. I believe a dispute re cafe at the beach. What a pity because this was a great location. It much reduced the amenity of the hotel. Paxos is a lovely peaceful location. The hotel is in a great location with the major asset its pool. This would be a wonderful spot and I am sure in great demand if the place was up graded and the courtesy bus to the beach re installed. What a pity the owners can't see it. After a flight to Corfu, then an hours trip on the jetfoil we arrived on Paxos and then had a ten minute transfer to our hotel. The hotel is quite old and the rooms pretty basic which is the norm in Greece, however, we had everthing we needed, fridge, kettle etc. The breakfast was the normal toast and jam or for a few euros you could have eggs and bacon, which we did every morning and was very good!! The location of the hotel was ideal only a 100 yards from the small town square and a very tempting bakery. The hotel staff were friendly but kept very busy most of the time. There is a roof top swimming pool, a rarity in Paxos, with a great views and a great bar serving snacks and wicked cocktails!!!. We were there during the European Cup so most evenings there was a match on the large TV in the downstairs bar, where the owners son cooks great pizzas. Our rep Mike had only just arrived, it was his first time as a rep, but he took to it like a duck to water and was great fun and always available to help with any problems. We found paxos 3 yrs ago and in june of this year we go back for the forth time.the resort is so quite during the day with the only thing that moves is the sun!!! The hotel is yet very basic but the friendliness of the staff far make up for this, the top deck pool is a sunworshipers haven and the pool is kept very clean and tidy, night time entertainment is very limited at the hotel, but the pizza's are amazing! Also the food around the pool is pretty good to especially the iced coffee. 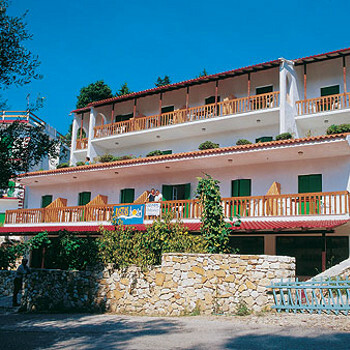 We had heard good reports about Paxos, but we were disappointed in both the resort of Lakka and the accommodation. We felt that the Bastas was extremely basic and bordering on being inadequate. We have visited various parts of Greece and understand basic accommodation, but there is an acceptable level. The kitchen area was just a sink with a dish drainer where all the crockery and cutlery were kept as there were no cupboards or drawers. There were 2 twin beds and only room for one bedside table. The bathroom was very basic and the toilet seat moved 45 degrees when you sat on it. It was just about clean, but I wouldn't like to look too carefully behind corners - not my idea of cleanliness. We would not return to Paxos and certainly not to the Bastas.